One of the famous 3D Pool Games simulates 3D Pool game on your computer with full 3D environment and perfect 3D sound, a really 3D Pool game for you ! download 3D live Pool to have try ! 3D Live Pool Game - This 3D Pool Game simulates 3D Pool game on your computer with full 3D environment and perfect 3D sound. It features easy and addictive game play,supports 3-Ball, 8-Ball, 9-Ball, 15-Ball, Straight, Rotation, BlackJack and Bonus games. The balls roll just like real ones, and you can position your cue shot to hit at various places on the cue ball for different spins! 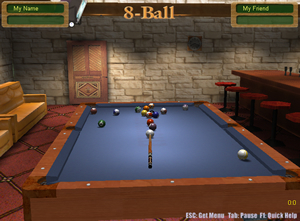 3D Live Pool has single and multi-player modes. You can play online or off. 3D Snooker Game - This 3D Snooker Game simulates snooker on your computer with full 3D environment and perfect 3D sound ! The Really 3D Snooker Game for you ! Quick Snooker Game - Snooker game and Snooker Pool for your Windows desktop! download and play the best snooker game - Qucik Snooker here! Platypus Game - Collosatropolis has invaded the peaceful land of Mungola. SubmarineS - Navigate your ship through a minefield. Destroy enemy subs before they get you, super Submarine Game. Net Sea War - Type Sea War board game you can play against computer or real-life opponents ! AirStrike II - Rough, cruel and intense helicopter 3D AirStrike 2 action game that makes you fly and fight over desert, water and industrial areas ! Alien Shooter - the new Alien Game - Alien Shooter will shoot all your time !